There are a myriad of Comfrey uses and history, we would like to share some with you here. In ancient times the herb was called ‘knitbone’,’ all heal’ or ‘woundwort’ and was used topically for healing cuts, bruises, fractures, sprains, injured tendons/ligaments, sores and skin ulcers. 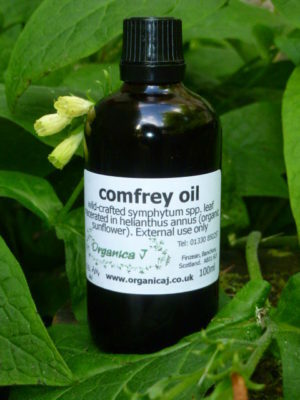 On the skin, comfrey is an emollient, soothing and was used to heal scars and blemishes. It was also said to promote a youthful complexion. It is now believed that the allatoin (a main component of comfrey) is responsible for the growth and multiplication of skin cells. The medium we use for maceration is organic sunflower oil, as a rich oil full of vitamins and moisturising. Our comfrey oil macerate is effective for use in massage and can be easily blended with other carrier oils and essential oils can be added. We use comfrey oil macerate regularly in our clinical aromatherapy practice, for clients for which comfrey oil would be effective and approriate for their individual needs. All our products are only suitable for topical use. 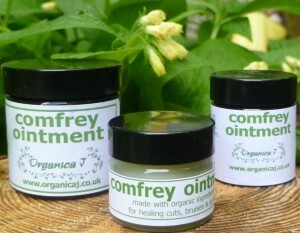 For further information here are three links to research papers on comfrey ointment. (1), (2), (3). 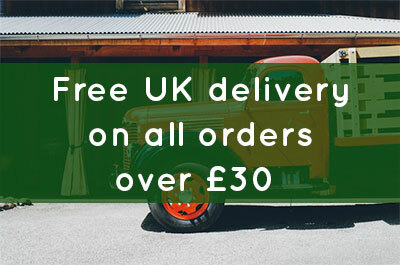 Our own comfrey uses – we have 6 products which contain our own wildcrafted comfrey from Aberdeenshire, Scotland – the comfrey oil macerated in organic sunflower,comfrey ointment,gardener’s hand balm, herbal foot balm,reflexology balm and Skin SOS Balm. The comfrey is harvested by hand from deep within the rural countryside here in Aberdeenshire. We have permissions to access a private piece of controlled land for the harvest. It is free from artificial fertilizers, pesticides and the comfrey grows completely naturally in its own environment. The harvest took place this year in May and June 2016 and we choose the optimum conditions for harvesting the plant as early in the season as we can (finding consecutive dry days can be challenging!). The harvest is fully sustainable and damages no part of the land. Gardeners Hand Balm – Great repair and deep moisturising for cut, grazed, dry or rough hands. Herbal Foot Balm – Excellent regeneration and deep nourishment for overworked and/or damaged feet at the end of the day. Reflexology Balm – Tested and used by reflexologists. This product was made by request and has been so popular. Many reflexologists also use the herbal foot balm too. Skin SOS Balm – The Skin SOS Balm was developed following many requests from customers for a product that would specifically help with scars, and skin issues. It contains a rich blend of powerful organic carrier oils and essential oils, which can be helpful on scars, also on psoriasis and eczema-prone skin. After much testing it was found also to be helpful for use on new tattoos and after tattoo removal. Protective, calming and regenerating.